Tomorrow is one of the craziest events in Hoboken- the Hoboken St. Patrick’s celebration. For the 24th time, the city will have a parade, turn green, and thousands upon thousands of drunks in their 20’s and 30’s will descend into the streets, bars, and apartments. The drinking starts early, refills happen often, and everyone pretends they are Irish. For the last 5 years I have followed the same routine to a successful St. Patty’s Day and it has always involved Three A’s Bar and Grill. It has been drinking at my apartment starting at around 7:30am, heading out to Three A’s right before they open, then spending 5 or 6 hours drinking at the bar, and then a couple more at another friend’s house party. I made my 2011 trek over to Three A’s Bar and Grill this time just prior to St. Patty’s Day. No the bar is not owned by Brett Anderson, Mark Ellis, and Cliff Pennington (wow that probably was understood by 2 out of the thousands and thousands of readers of this entry). It was a Thursday night when I walked inside the familiar place but this night was nothing like the St. Patty’s Day crowd that I associate with the place. 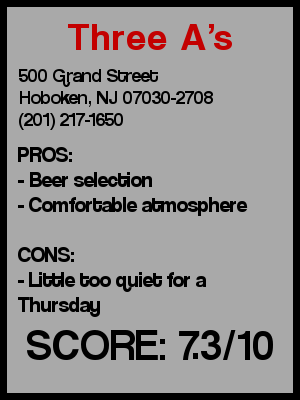 Three A’s is located at the corner of 5th and Grand, one of the furthest west watering holes in Hoboken. Being so far from the main drag, it gets a very neighborhood crowd. The part of Hoboken that surrounds Three A’s is traditionally Italian with a lot of born and raised Hobokenites. Hearing some of them conversing in Italian is definitely something fairly unique to this bar. The crowd was mainly mid 30’s and older and they were watching a little college basketball and a lot of some of TV’s finest shows like Winter Wipeout on ABC. In fact the place was a little boring, a far cry from the craziness that will ensue at 9am on Saturday. Three A’s has a front room which consists of the bar and a back room for dining. One of my favorite parts about 3 A’s is that the bar is very long, and while not an island bar, it does allow for people to sit on all four sides. I also have an appreciation for the old Hoboken street signs they have hanging up. The music was not noticed but there was a Touchtunes machine so I guess if you wanted to you could have set your own mood for the night. They have a better beer selection than some of the recent places I have gone too. Being a hefeweizen fan I had a pint of Franziskaner Weissbier and followed it up with Sam Adams’ seasonal Noble Pils. Prices were pretty average. On the tables there was a list of bar specials including an intriguing one for $4 well drinks and $3 shots all night on Fridays and Saturdays. Don’t know if that’s going to be active on St. Patty’s but that seems like a good deal. Preconceived notion – I’ve been here many times before, sometimes on the weekends and sometimes during the week, but since it was a Thursday I figured there would be a neighborhood crowd, but one that varied in age. Crowd stereotype – 35 and up. Value – No specials on a Thursday but decent ones on Friday and Saturday night. Date – Pretty good place. Not too crowded and a little quiet so you gotta have something to talk about, but they do have good food and you can transition easily back and forth from the bar. Overall - I actually was pretty disappointed with Three A’s. I thought there would be a bigger crowd on a Thursday night. We stayed till almost 11 and it definitely didn’t seem like the crowd was going to pick up. Instead the crowd felt like a Monday night crowd and was a little older than what I remembered. It is definitely a great neighborhood bar and they do have some good beers on tap. I would still highly suggest anyone going out for Hoboken St. Pat’s that wants to go to a bar with 10-15 friends, especially one that won’t have a long line, and has an affordable cover to head over to Three A’s. (Of course you could fight with the crowds on Washington and First Street to see a bunch of old irish people walk the street if you are into that sort of thing). Unfortunately, I can’t base this score on past experiences so I will give Three A’s a 7.3.